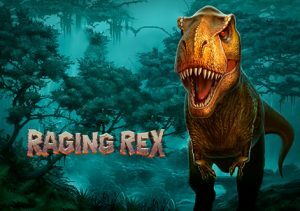 Head back in time to the Jurassic age in Raging Rex, a dinosaur-themed video slot from Play ’N Go. This volatile game is played using a 6 reel, 4,096 ways to win game engine and comes with stacked wilds, re-spins with walking wilds and a free spins round with roaming wilds or wild multipliers. Play on all devices from between 20p and £100 per spin. Set against a misty forest backdrop, the reels in Raging Rex include 6 lower paying fossil symbols and 4 more rewarding dinosaurs. The best of the these pay 20, 50, 60 or 75x if you land 3, 4, 5 or 6 in combination. Tyrannosaurus Rex is the wild. This replaces all other symbols apart from the meteor scatter. The Rex wild is central to the extras on offer in this Jurassic adventure. Rampage feature – these are triggered by landing an expanded Rex wild and filling reels 2, 3, 4, 5 or 6. The number of re-spins awarded depends on where the stacked wild hits. If it lands on reel 2, then you’ll get a single re-spin. On reel 6, you’ll get 5. On each re-spin, the stacked wild moves 1 reel to the left until it reaches reel 1. Raging Spins feature – this round is triggered by landing the meteor scatter. Land 3, 4, 5 or 6 of them on the same spin and you’ll receive 8, 15, 20 or 30 free spins. The stacked wilds aren’t in play during the free spins but there are a couple of added modifiers to boost your winning chances. Opt for the Wild Hunt feature and many of the Rex wilds will come with 2x and 3x multipliers attached. Land more than 1 of these in the same winner and the multipliers are combined. In the Primal Rage feature, the Rex wilds moves between reels 2 and 6 on each free spin. Unlimited retriggers are possible here too. There’s plenty to like about Raging Rex, especially if you like volatile action. This is a high variance game so you can expect plenty of big bankroll swings – you can also win 5,000 times your bet on every free spin! Easy on the eye and coming with some potentially explosive bonus features, Raging Rex is an impressive addition to this ever popular theme. I also recommend you try Microgaming’s Jurassic World which is very good.